Lunges can help strengthen your hips. Hip movements are important to many yoga poses. Indeed, there are even classes labeled “hippie” yoga -- not because you have to wear a tie-dyed outfit, but because the sessions focus on hip action. To strengthen and stabilize your hip joints, be sure to work your thigh and gluteal -- aka, rear end -- muscles as well as the muscles in your hips. 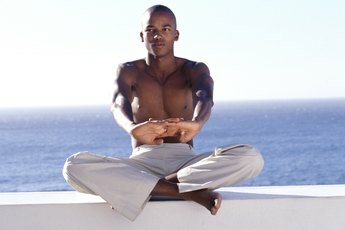 Yoga provides many poses, or asanas, to achieve those goals. Flexibility is as important to joint health as the strength of the joint’s muscles. When you’re working your hips, lunges provide a good way to improve your strength and flexibility at the same time. Lower yourself to your hands and knees, then move your left foot between your hands with the shin vertical and the foot flat on your mat. Extend your right leg back and balance on the ball of your rear foot. Lift your arms place them at your sides, just behind your hips. Lean forward so your body creates a fairly straight line from your head to your back foot. Hold the pose as you take three breaths, then raise your upper body into a vertical position and extend your hands straight up from the shoulders. Take three more breaths, then lower your arms and upper body before repeating the asana with your right leg forward. For a good core exercise that also strengthens the hip muscles, sit on your mat with your legs extended in front of you, your feet together and your toes pointed up. Keep your upper body erect with your arms at your sides, your palms flat on the mat and your fingers pointed to the front. Draw your knees up toward your chest so your legs are bent at 90-degree angles with only your heels touching the mat. Grasp your lower thighs from the outside and lean back so you’re balanced on your rear end. Exhale as you straighten your legs by raising your shins and pointing your toes upward. Extend your arms forward so they’re parallel with the floor. Your body should look like an upside-down “A” shape. Beginners may wish to place a strap or belt around the balls of their feet and grasp the free ends to help maintain their balance. Hold the position for at least 30 seconds, or for as long as you’re comfortable. The Warrior II pose will strengthen almost all of your leg muscles, from your ankles to your hips. Stand erect with your feet shoulder-width apart, then extend your arms straight to each side so they’re parallel to the floor. Spread your legs to each side so your feet are under your hands or lower forearms. Turn one foot inward just a bit. Turn the other foot about 90 degrees so it’s approximately aligned with the hand on the same side, then bend the knee on that side 90 degrees and face the direction of that lead leg. Keep your upper body vertical and your arms straight. Hold the pose for several seconds, then repeat the asana on the opposite side. To strengthen muscles ranging from your thighs up through your abdomen, try the Revolved Triangle. Begin in an erect posture with your arms at your sides. Extend your left leg forward with your knee straight. Your leg should form about a 45-degree angle relative to an imaginary line drawn from your head straight down to the ground. Point your left toes forward, turn your right foot out just a bit and put your hands on your hips. Inhale, lift your upper chest, then exhale as you bend forward from your hips until your upper body is parallel with the floor. Reach straight down and touch your fingers to your mat. Inhale as you place your left hand on your hip, then exhale as you rotate your upper body to the left. Turn your head and left shoulder toward the ceiling, then raise your left arm as vertically as you can. Hold the pose briefly, then reverse your rotation and put your hands on your hips before repeating the asana in the opposite direction.